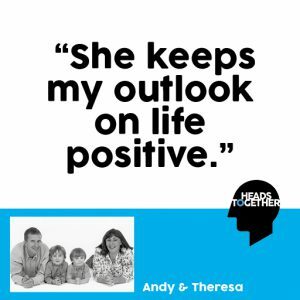 My name is Andy, and I would be lost without my wife Theresa – she keeps my outlook on life positive. I have MSA. It is short for Multiple System Atrophy, a rare neurological condition. My condition has developed over the last five years. Previously I was very active; a qualified Mountain Leader, an ice climber, a skier, I’ve even climbed all the Munro’s. In short I’ve gone from being very active to struggling to climb the stairs, and because of MSA I look and sound drunk all the time, even though I haven’t touched a drop. MSA is non-curable; the treatment just manages the various symptoms. Hand in hand with MSA goes depression, yet despite the prognosis, my outlook on life remains positive and a lot of that is down to Theresa. Theresa is my main carer. Not only does she look after the home and our two sons, but also helps me manage my limitations. Theresa is always one step ahead of me; she knows how I will feel before I do. She knew months before I had a bad accident I should stop driving, she knows that one day I’ll find the stairs too difficult, so has prepared a room for me downstairs. I’m about to retire after 26 years of working across UK and Europe, and I’ve just raised £4,500 walking Hadrian’s Wall Path for Crisis with the help of lots of friends, and of course Theresa. I will have to adjust to life at home, but Theresa and I still have loads planned for my “retirement.” There is so much that life still has to offer – we’re not ready for me to sit in an armchair just yet.